A Elmo birthday party is a perfect theme for an Elmo fan. If you kid loves everything about Elmo then throw her a Elmo theme party. Lets start planning. "Wan´t cool Elmo Birthday Party Ideas?" To make this Elmo birthday invitation you need to take a picture of your kid holding Elmo (a stuffed toy). Print the picture out in invitation paper. Add some red glitter glue to Elmo. So that it looks like Elmo is shining. Below the picture write something like "You are invited to my Elmo Birthday Party" and in the back of the invite write all party information. To make this Elmo birthday party invitation you need red, orange, white and black cardstock paper. Start by drawing and cutting out a red oval shape Elmo face, two large white eyes, two small black eyeballs, one big oval orange nose and one black mouth out of the different coloured cardstock paper. On the back of the invite write all the party information: date, time. address and RSVP to "phone number" by "date". You don't have to dress your kid up in an Elmo outfit, if you want! Great. A good idea is to dress your kid in the Elmo colours. Or you can buy a shirt with Elmo's face on it, that your kid can wear. The theme colours for this Elmo birthday party are bright red, blue and orange. Decorate the party area with lots of streamers and balloons in the theme colours. Have a personalized Sesame Street birthday banner. Decorate the party area with Elmo and Sesame Street toys, posters, books etc. Decorate the walls with big Elmo faces, make these faces out of red posterboard. Cut out Elmo faces out of posterboard and use crayons to colour Elmo's face. Make 3-5 Elmo faces and place them in strategic places. Use a bright red table cover and plates, cups, etc with Elmo's face on them. Make a centrepiece by tying a bouquet of balloons to a stuffed Elmo toy. Invite the kids to make Elmo caps. As guest arrive take them to the craft table and let them make their own Elmo cap to wear turning the party. Provide the kids with a light red cap or visor and sticky craft foam sheets. The kids have to decorate the front of the caps to look like an Elmo face. To make this Elmo face caps you will need two white craft foam circles; the eyes, two small black craft foam circles; the eye pupils and an orange craft foam oval; the nose. Attach Elmo's face pieces to the front of the cap with liquid glue. Invite the kids to play with Elmo dough. Provide them with red play dough, different shape cookie cutters and rolling pins. This is lots of fun especially for younger kids. Beforehand cut out several E's from red cardstock paper. Invite the kids to decorate an E. They can do this with the help of liquid glue and stickers, seeds, beans, glitter, feathers, etc. Before the party decorate a clear jar with Elmo stickers. Put goldfish crackers inside the jar, count them so you know how many goldfish crackers there are inside the jar. As kids arrive to the party ask them to guess how many goldfish crackers there are in the jar. When the party is over reveal the number and announce the winner. Give the winner a small gift. This Elmo birthday party game is similar to "Pin the Tail on the Donkey". 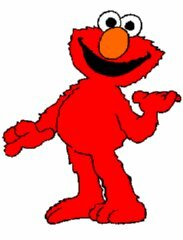 Make an Elmo face out of red cardboard, with crayons paint Elmo's face features, but don't paint a nose. Cut out lots of small orange noses out of orange paper. Before the game starts blindfold the first kid to go and spin her around one time. Have a price ready for the winner. This Elmo birthday party game is similar to "Simon says". The kids can't do anything if the leader doesn't say "Elmo Says". If a child moves without the leader saying "Elmo Says" that kid will sit down for one round. "Elmo says…jump on one foot!" — Children are jumping on one foot. "Elmo says… node your head!" "Elmo says… close your eyes!". This Elmo birthday party game is similar to "Hot Potato". Invite the kids to sit down in a small circle and have some music playing in the background. Pass a Rubber Duck to one of the kids. The kids have to pass the Rubber Duck to the next player as soon as possible. Stop the music, the kid holding the Rubber Duck is out of the game. Play until there is only one player left. This Elmo birthday party game is similar to a treasure hunt game. Hide small Elmo related toys around the party area. Divide the kids into groups, give each group clues to the hidden toys. The group who finds the most toys wins all the toys found in the treasure hunt. Elmo's pet fish Dorothy jumped out of her bow, help her find her way back into the bowl! Before the party buy a large fish bowl and 4 plastic goldfishes. At party time put the empty bowl at reasonable distance from the kids and invite the kids to take turns tossing the fish into the bowl. Give points, out of 8 times who managed to toss Dorothy into the bowl most times. Have a small price for the winner. Invite the kids to have a bubbles war. Provide them with plenty of bubbles to blow. The kids will love playing this game! Finish the party off with a Elmo piñata, lots of fun and the kids will love to get more goodies and candy. Pick the best Elmo birthday party food & drink ideas you fancy the most. Fish Tortillas: With the help of a fish cookie cutter, cut out fish shapes out of homemade tortilla chips. Mini Fish Sandwiches: Make this with the help of a fish cookie cutter. Elmo Mini Pizzas: Decorate the pizzas to look like Elmo's face. Elmo Cookies: Make Elmo face cookies, do this by making cookies and frosting them red. Decorate the cookies with mini brown m&ms for eyes and mouth and orange m&ms for nose. Elmo JELL-O: Make JELL-O in the Elmo colours. You need to buy or make 40 or more cupcakes. Frost the cupcakes with red frosting. You need to use two white round candies for the eyes and black sweet gel for Elmo's eyes pupils, a orange gumdrop for a nose and black liquorice for a mouth. 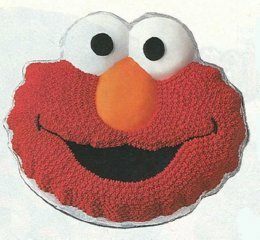 Buy a Elmo face pan, it's not expensive and it will save you lots of time preparing the cake. Use gel frosting to decorate Elmo's face features in the corresponding colours. Before that fill the cake with vanilla and chocolate cream filling. To make Elmo goody bags you need to buy red lunch bags, fill the bags halfway with the favors and tie a orange ribbon around the top. You can also add some Elmo stickers to the bag. Fill the Elmo goodie bags with Elmo memo pads, Elmo memory game card, play dough, kid's scissors and sharpeners, Elmo stickers, Elmo bouncing mini balls, balloons and lots of candies. I hope our Elmo birthday party ideas will help you plan a cool Elmo birthday party for you kid.